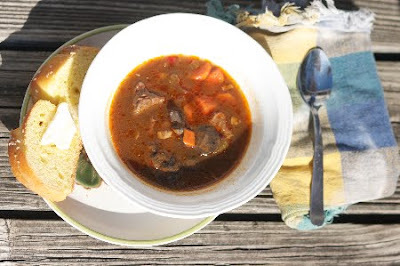 cardigans and kids: another soup recipe -Beef Burgundy. another soup recipe -Beef Burgundy. The original recipe calls for short ribs. I only make Matheau endure ribs in the form of country style ribs once a month. (Country style ribs and mashed potatoes make for a decent meal, but far from a favorite.) Ribs are always a bit greasy to me, so two reasons I chose the roast meat. 1. I wanted my husband to enjoy it, and 2. The stew meat is a much faster way to go. No need to remove the meat from the bone later in the cooking process. 1. Season the cubed beef with salt and pepper. Then toss with the corn starch. 2. Heat the oil over medium-high heat in a large heavy bottomed pot. Add the beef and brown on all sides for about 6 minutes. I just keep turning them with a pair of tongs. Transfer back to the bowl you tossed the meat in. 3. Add the mushrooms to the pot and cook for about 4 minutes. Transfer them to a bowl. 4. In the pot, now add carrots, celery, onion, garlic, and bacon. If the pot seems dry, add a tad more olive oil. Cook until caramelized, about 5-6 minutes. 5. Stir in the tomato paste. 6. Return the meat to the pot. Now add the thyme and wine. Raise heat to high, and stir, scraping up brown bits with a (wooden) spoon, until slightly reduced, for about a minute. Add beef stock and water, again return to a boil. Reduce heat to a simmer, add the mushrooms. 7. Simmer partially covered for 2-3 hours. Season with crushed red pepper flakes, and salt and pepper if needed. *What did I serve the soup with? I have also made a batch of egg noodles and then added them to the bowl when serving. Since there were plenty of veg in the soup, I served mine with Challah made with a brioche dough.